Hardwood floors for your home are a durable, long-lasting investment. While they are generally easy to maintain, moving furniture can result in scratches and gouges. Felt floor protectors will help reduce and prevent damage and preserve the integrity of your wood flooring. There are a number of available products designed to attach to furniture legs and protect your wood flooring (you’ll find them named all sorts of things – feet, socks, paws, etc.). Felt padding for hardwood floors are your best bet to protect your hard surfaces from scratches. They are durable, manufactured specifically for the task, and are more effective than other measures. For example, while pieces of old carpet or toweling may prevent scratches, they are unsightly, ruing the aesthetics, and tend to slip, leaving your expensive floors vulnerable to damage. Casters may work on some dining chairs and dressers, but they are not a viable option for couches or beds, which are heavy enough to cause permanent damage. Self-adhesive made of durable, compressed felt with a powerful adhesive are very affordable and will buffer your flooring without detracting from your decor. There are a few things to look for in choosing a quality product. Self adhesive. Felt pads that are made to be nailed onto the furniture can cause damage to both your floors and furniture legs. While reading one recent Amazon review, I saw a problem was that the nail was coming back through the pad, leading to digging which was obviously disastrous. Be careful here. Avoid mess, hassle, and potential damage due to improper installation. Not only that but tacks and nails bring about a safety risk to children and animals. Compressed felt. The compressed pad is different because the fibers are packed closer and tighter which makes them clean, compact, and less likely to frizz. Thickness. 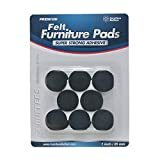 Thicker buffers will do a better job of cushioning furniture and protecting hard floors and surfaces from super heavy furniture like huge buffets. They provide just a little bit more distance and cushion between your surface and scratching chair and table legs. Size. To 100% prevent unwanted scuffs and scratches, ensure the padding (whether pre-cut or custom fit) cover the entire surface of the furniture legs. Not that a smaller pad won’t suffice sometimes but as a general rule, you want to make sure the pad covers at least 80% of the bottom of the leg. 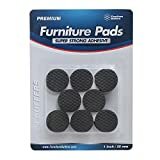 The Jumbo Pack of Furniture Buffers Furniture Pads (seen above) is both high quality and high value, and it meets all these specifications we mentioned above. The pack is 144 count with 8 different sizes (the most of any variety pack you’ll find anywhere), guaranteeing a great fit for every leg in your house – or any other object that could potentially grind on something (such as tile or a marble countertop). Plus, the combination of thickness and dark black color means they’ll sleekly staying out of sight. These flooring guardians are not only durable and made to last but they have a rainbow of sizes which is very important to look for in a value pack. And while you’re protecting your investment on the ground, why not protect the ones you buy at Best Buy? Electronics such as TVs and even laptops can even reap the rewards of cushioning. Read more about how you can ventilate your laptop with Furniture Buffers.